Is it safe for young riders? The Yuebo self balancing electric scooters are manufactured by the top class manufacturers who believe in quality and safety as the prime motto of their business. The exclusive masterpiece which travels at great speed and gives an amazing mileage has become one of the most wonderful gift pieces of any occasion. It is very easy to learn and ride and even the first time riders can feel the ease of its built. The customer’s reviews have been quite appreciable till date and they prefer Yuebo over other boards because it is cool and strong and is capable of giving them an obstacle free ride even in mud and rain. Read on, to know more about the mind blowing features of the Yuebo electric scooters. The first question which comes up in the mind of every buyer today is whether the hoverboard is accredited certifications by the Underwriters Laboratory. Well if the same question has started swirling in your head, then you should know that these hoverboards are UL 2272 certified after passing through 159 point rigorous safety tests. The UL 2272 certifications guarantee that the fire accidents and short circuiting or sparkling do not occur. They are the safest and high quality product. These are also authorised by the Sheepfun Store in the US. They are said to not tolerate any kind of infringement. The speed craze has aged back to centuries. Everyone loves speed and so we want to tell you that these hoverboards too gives great speed with 7 miles per hour being the maximum it offers. Although there are alert signals so that the young rider’s safety can be considered, they are great for the riders who are used to riding as well. By mileage we are referring to the maximum distance that the hoverboard can cover in one charge. The Yuebo electric scooters offer a range of 10 km which is good for a ride out with your friends or even your children. You will be free from the anxiety of charging the board after every half an hour’s ride. You can get a beautiful ride on the Yuebo hoverboards as the smart manufacturing has made it go as smooth as ever before. Whether you are riding straight, roller coasting around the field, going in a spiral movement or simply commuting, these are perfect in all ways round. It is also not bound to work inside or just outdoors. They are equally good every time and everywhere. 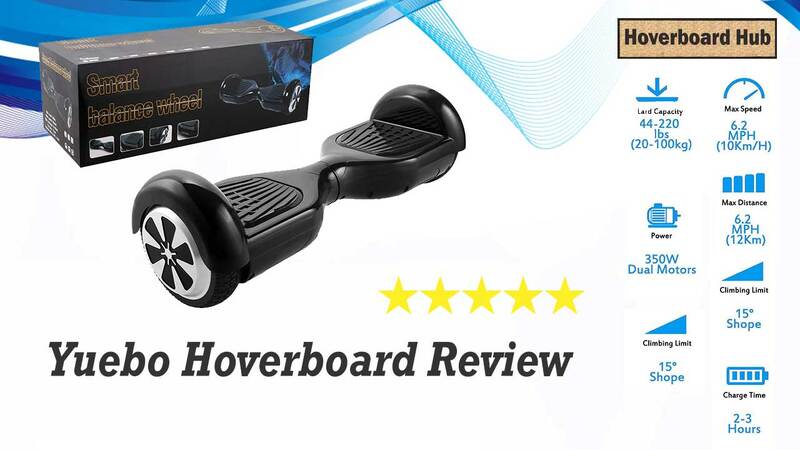 The features are no doubts amazing, in addition to it, these hoverboards are excellent in its built as well. The shatter-resistance polymer frame prevents the body from minor scratches and makes it durable for an everlasting ride. You also get the fender bumper protection to protect you from the uneven surfaces. The anti slip rubber foot platforms give you one hell of a ride. The moment you step on the hoverboard, the magic begins. That is why these have been one of those favourite choice of the customers. One of the lovely features of this electric scooter includes the battery protection mechanism. If you put your hoverboard on charging, the temperature sensors will detect if your battery is getting overheated. If so, there will be alert signals degenerated. Also, when your battery is charged sufficiently, the protection mechanism will automatically slow down the intake of charges and finally stop charging. That is one question which many of the viewers are questioning us. The answer is certainly yes. These hoverboards come with speed alert facility. So, it your young son/ daughter is trying to increase the speed limit, it will alert you via signals and ask to ride within the safety limits. Usually, 10 km/hr is the speed beyond which the alert is issued. If the speed is very fast, then the temperature sensors too can detect the heating of the hoverboard. You can then slow down and ride within the specified limits. So how much you need to spare from your pockets for buying these classy looking hoverboards? Well, you will be extremely happy to know that these are cheaper than other hoverboards in the market with similar features. Just a price range of $200 can fetch you a piece. So we can say that these are among the cheapest hoverboards of the year and are continuously winning over the hearts of multiple riders. What a great list of features these sturdy and smart hoverboards offer! The look is great, with advances 6.5 inch wheels which make an ever smooth and comfortable ride. You will always get a stable ride which is a guarantee and free from over-heating or sparkling. Adding to it, these are the evergreen riding gadgets which can climb upto 15 degree inclined planes at ease. These are great also because they offer a weight limit of 225 pounds. That means, it can apparently support upto 100 kilograms of a person. Even heavier people have used the board and say that they have never felt better before. These hoverboards are handy and light and can be transported from one place to another easily. Overall these are cool with top class protection mechanism which makes it really super cool. You will always get a stable ride which is a guarantee and free from over-heating or sparkling.